Out here in the Northwest we’ve had a hot hot summer. Which has led to a bountiful tomato season. It’s not usually this easy to grow tomatoes out here in Portland, the summer light is intense but often short lived. This year’s summer started in March, it has been a major treat for us grey sky dwellers. Friends are pawning pounds & pounds of tomatoes on me this week, here is my way of using up some of those souvenirs of summer. This is not your grandpa’s tomato sauce. Though I love the smell of simmering sauce all day long, the stirring and the dipping that all comes with making incredible homemade tomato sauce. I had a ton of tomatoes to use up and not a lot of time at home. 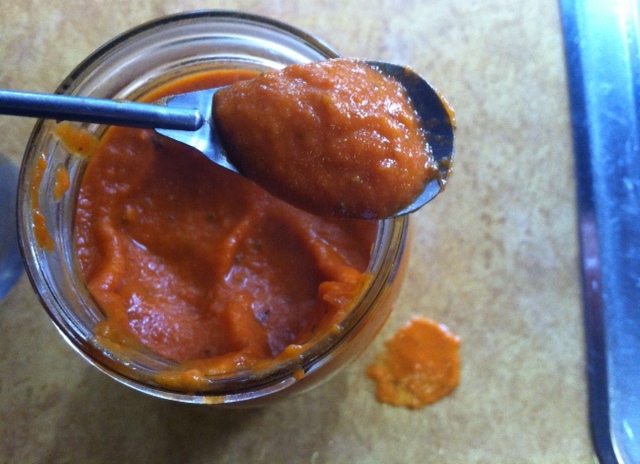 So here is an easy breezy tomato sauce. Preheat the over to 400. Rinse all tomatoes and cut just in half. 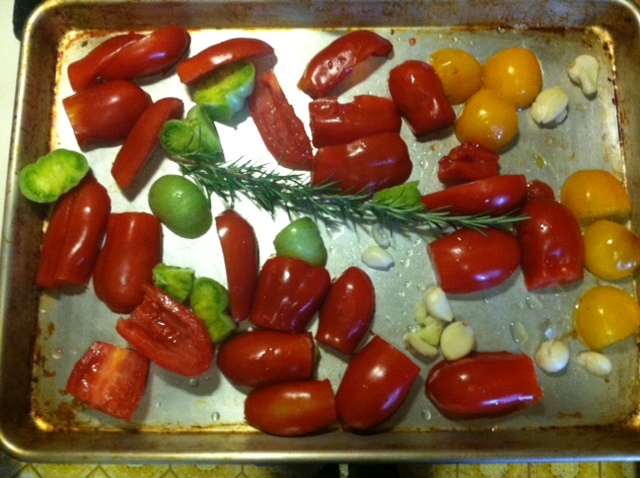 Place on a baking sheet along with the spring of rosemary and the cloves of garlic. Set your timer for 45 minutes and pop that pan into the oven. Go do your thing and when the timer is done, transfer these roasted goodies into a blender, along with the salt and extra virgin olive oil. (take the rosemary off the twig). Blend it all on medium for a minute, give it a taste to see if you’d like to add anything else to it and transfer to a jar. Let it cool before you put it in the fridge. Stop on by Seed to Health’s brand new website! Especially if you or someone you know has a new baby (or will be soon)! 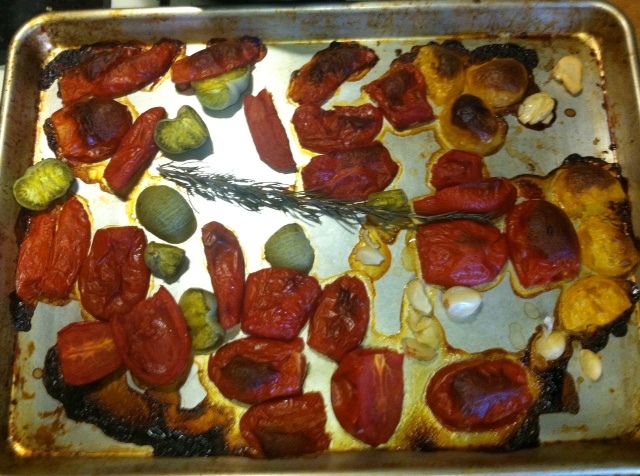 Posted in Recipes and tagged anti-inflammatory, clean eating, delicious, health coach, healthy recipes, healthy-living, heirloom tomatoes, portland, quick easy recipes, recipes, rosemary, san marzano tomatoes, summer, tomato sauce. Bookmark the permalink. 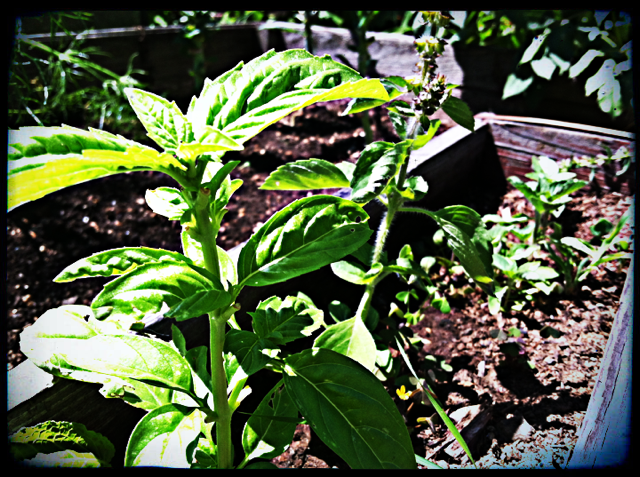 Tulsi, also known as Holy Basil, and I were introduce in 2009 by a dear friend. She gifted me a bottle of dried & capped Tulsi in a care package that was put together to soothe me as I mourned the loss of my father and got ready to tie the knot. So I poked around in some of my resources, liked what I saw about this renownd Holy Basil and started a daily ritual. As intrigue grew next stop was a book on Adaptogens so I could dive deeper into the fascinating subject. The term adaptogen refers to a variety of herbs or fungi that work synergistically in the body to augment our resistance to stress, anxiety, trauma and exhaustion. They enhance our body’s ability to deal with all of these common life qualities. They recharge our adrenals. Simply, as the name suggests, adaptogens help our body adapt. Some common and easy to find adaptogens are: ashwaganda, astragalus, licorice, reishi, shiitake & maitake mushrooms, aloe vera, chlorella and Tulsi. The unique chemistry of Tulsi is highly complex. Tulsi leaves contain tons of beneficial compounds known as phyto-chemicals. These compounds possess strong antioxidant, antibacterial, antiviral, adaptogenic, and immune-enhancing properties that promote general health and support the body’s natural defense against stress and diseases. I grew some of my own this year. Just a small batch just to see how it would fare. I have not always had the best of luck growing basil from seed. This little plant fared just fine outside, so I am going to plant a few more of the seeds inside. I am hopeful for a bigger batch for a spring harvest. All of this spicy information is here to offer you a diving board for some of your own research and experimentation. A wonderful book on adaptogens is Adaptogens: Herbs for Strength, Stamina, and Stress Relief by David Winston & Steven Maimes. Posted in Uncategorized and tagged adaptogens, anti-aging, anti-inflammatory, basil, beneficial compounds, calisthenics, detox, food, growing basil, healthy recipes, holy basil, life qualities, maitake mushrooms, meditation, skin care, stress, stress buster, summer, tulsi. Bookmark the permalink. I could not be more excited about these gems. The potato is SO versatile, especially this one, with its medium starch level, offering soups, mashing, baking and salads a great texture. These are acceptable at every meal. Purple is by far my favorite color, eating it is a pure pleasure! These gems will make frequent appearances on our table, considering I have 12#s of them. Purple potatoes are comparable to the good ol’ russet in nutrition facts, a bit of protein, some fiber, substantial levels of potassium. Potassium plays a crucial role, along with sodium, in regulating our blood pressure. 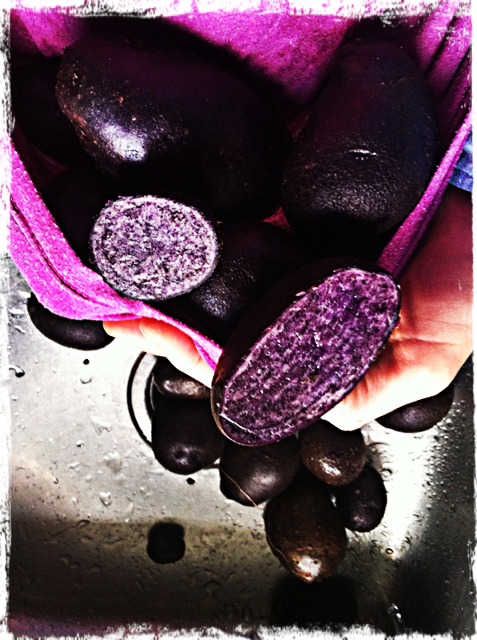 Purple potatoes are super special because of their antioxidant levels. Anthocyanin is a pigment that creates the purple color in the potatoes and also acts as an antioxidant. In this modern world we need to saturate ourselves in antioxidants! This recipe goes down in the Mustgos category. 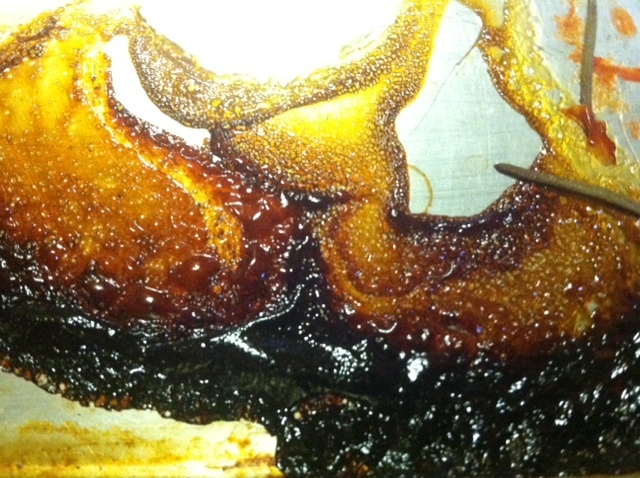 Heat oil in saute pan over medium, when melted minced garlic. Stir/saute for about 1 minute, add ground cumin seed. Stir/saute for about 5 minutes until garlic starts to brown and cumin smells amazing. Next add potatoes toss and cover with oil & spices, then add the chopped mushrooms. Combine flavors and stir/saute for about 2 minutes. Add broth, bring to a quick boil, reduce heat and cover for about 8 minutes. Meanwhile, peel and grate kohl robbie and ribbon the leaves. When potatoes and mushrooms are almost finished add the greens to the top, recover and let them steam for about minute. Serve in bowl with grated kohl robbie on top. This is healthy & hearty meal that your whole family will love. Stop by my website and check out some more holistic nutrition and lifestyle solutions. 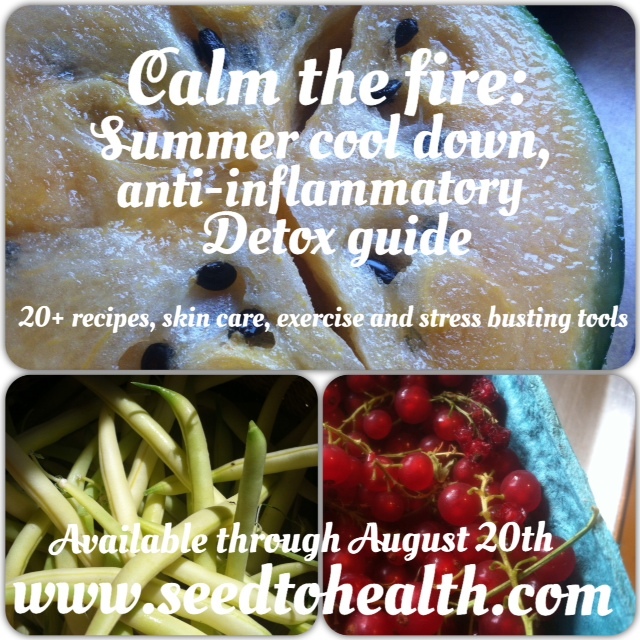 Calming the Fire: Summer Cool down, anti-inflammatory and detox is a top-notch homestudy program for some accessible preventative tools. Prevention, as far as I am concerned, is one of the best cures! 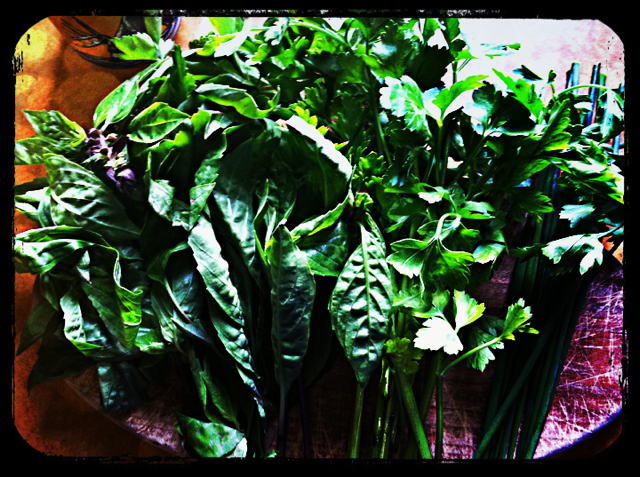 Posted in Uncategorized and tagged antioxidants, detox, easy recipes, feeding children, feeding toddlers, health coach, health solutions, kohl robbie, nutrition, portland, purple potatoes, summer, wholesome. Bookmark the permalink. How do you beat the heat? Posted in Recipes, Super foods and tagged basil parsley, extra virgin coconut oil, health coach, healthy recipes, lemon, lemonade, summer, vegetarian. Bookmark the permalink. Choice pepper, I used a dried cayenne and cut it into small pieces for a nice amount of heat. If you like it spicy go for a fresh habanero. If you want it mild use a half a jalapeno. Start small and add more, this is supposed to be refreshing not blazing. Come check out Nourish an anti-aging/inflammation home study. This guide is loaded recipes, workouts, bonus skin care guide and a background on inflammation, the why and how to combat it for powerful disease prevention! Posted in Uncategorized and tagged anti-aging, anti-inflammatory, cauliflower, ceviche, corn chips, dinner, extra virgin olive oil, food, health coach, healthy recipes, healthy-living, nourish, portland, prevention, quality corn, skin care guide, vegetarian. Bookmark the permalink. 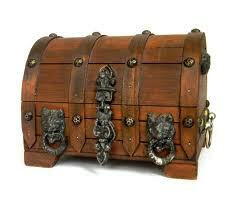 This nutritional treasure chest may be an ingredient that is a bit foreign to you. SEAWEEDS are nutrient dense plants that are consumed world wide. Coastal cultures on every continent have enjoyed these (formerly slimy) plants for ages as staples of their diets. Your cells love this stuff! Your digestive tract appreciates the help, your liver likes the boost, free roaming oxidized cells will be eaten up AND your bones & joints will absorb more of their favorite minerals. 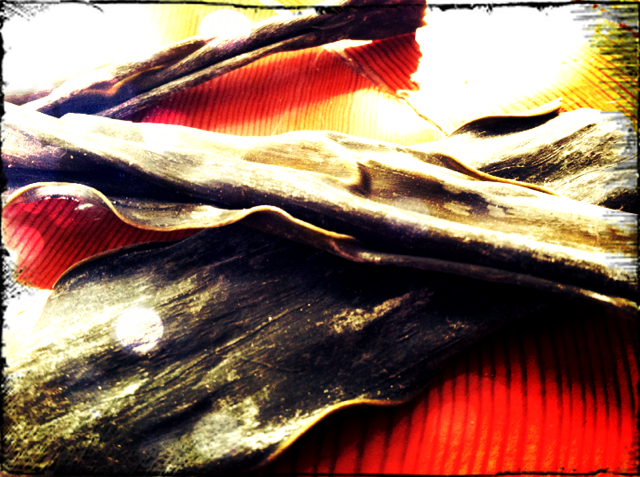 Seaweeds are versatile, calming & alkaline. 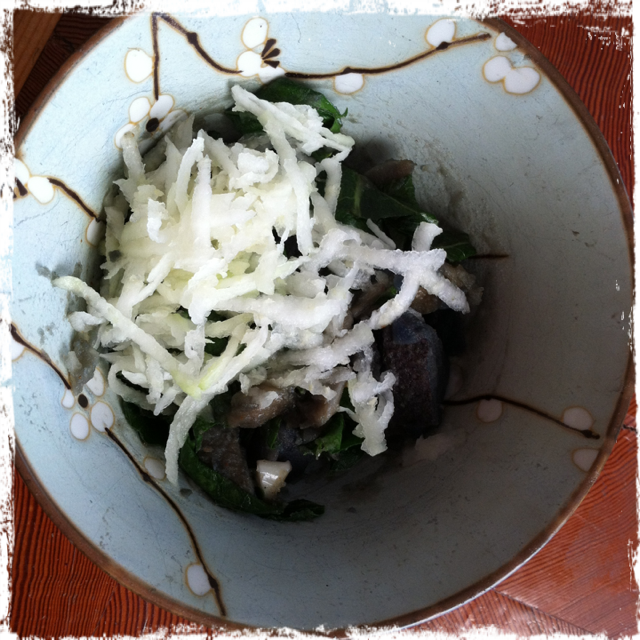 Add seaweed to soups, sauces, salads & beverages, or make kelp chips! 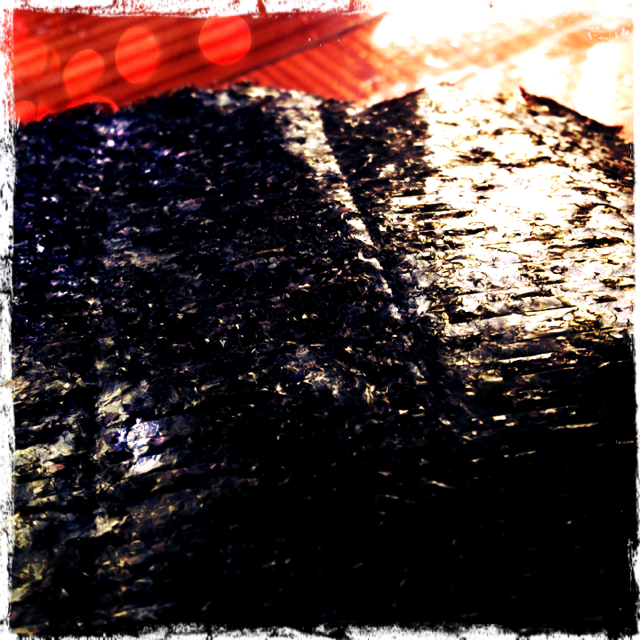 Nori is the easiest more palatable for most people, initially. Keep your eyes peeled for seaweed snacks, which are widely available and a great place to start enjoying the ocean’s treasure. Do you make your own beans? Next time you boil beans add 4-6″ of Kombu to the cooking water (it will disintegrate after about 2 hours) Kombu contains a glutamic acid that will tenderize the proteins of the beans, hence making them easier to digest, which subsequently means less gas. No more magical fruit! So the next time you are in your kitchen wondering what you really want, think of seas vegetables! 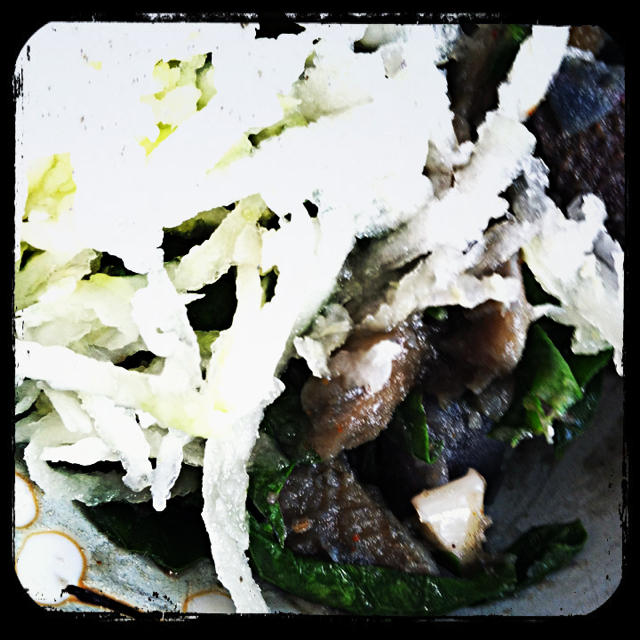 Rinse hijiki in a colander then transfer seaweed into a sauce pan soak in 1c. water for 10 minutes. Bring water/seaweed to a boil and cook uncovered for 5 minutes. Add ½ c water, lower heat, cover & simmer for 20 minutes. Enjoy playing with seaweeds. Do you have much experience? Where will you start? 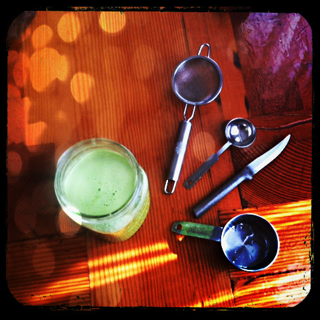 Look out for this summer’s 2 week detox home course, Coolade. You’ll learn about inflammation and how to combat it with food, herbs and lifestyle adjustments. Learn about inflammation now and you will be able to dial in powerful preventative habits. Once you know how to combat inflammation you are a super hero with anti-aging powers and disease fighting tactics! This summer’s course will be a bolt of well being! Home courses work so well because you go at your own pace. Included in the course are 4 chapters, with accessible information on inflammation. How & why in this modern world. Recipes to counter it’s wear and tear on your systems. In depth information on how to take care of your skin (your biggest organ and main tale teller of what is going on inside). Stress busting tactics you can use anywhere and home exercise routines that you’ll love to sweat to. Resources, links and support compliment it all so you can go as far as you want in understanding the subject. You can take the steps to turn back the hands of time and fill your body full up with anti-oxidants, healthy oils and delicious summer beverages. Posted in Recipes, Super foods and tagged antioxidants, beans, beverages, broth, chips, detox, diet, health coach, healthy recipes, holistic, inflammation, kombu, minerals, nori, nutrient dense foods, nutrition, nutritionist, portland, protein, recipes, resources, salads, sauces, seaweed, seeds, soups, staple foods, study, summer, vitamins, world, worldwide. Bookmark the permalink. Sweet potatoes are so delicious. Since we started feeding our daughter solid foods last year, honestly, we haven’t had a white potato in our house. We have been straight sweet potatoin’ it. 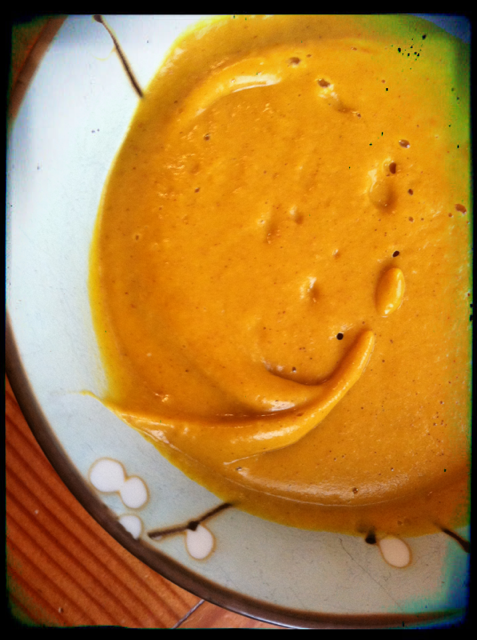 As you know I love the steamer, you can make sweet potatoes in under 10 minutes. Since it has been so hot out here in Portland and the days are longer, my man insists on eating a bit later than I like. (I have a pretty strict rules about have my last meal 2 hours before I got to bed). But like I tell my clients, friends and myself 80% of the time eat like a boss and the other 20% eat BBQ with your husband an hour before you go to bed. Those mornings after I eat late, I find I am not so hungry in the morning. But I know better than to skip breakfast. This super food soup is warming, full of nutrients, spices and protein, a great way to get the day going. Steam up those sweet potatoes and transfer them into the blender hot, put everything else in, along with up to 2 pints of water (depending on how thick you want it) and blend on high for 2 minutes. Pour in a mug or bowl and ENJOY the sustainable energy. Want to learn more about super foods, cleansing and immune boosting? Stop by and check out Boost for some rocking immune building support. 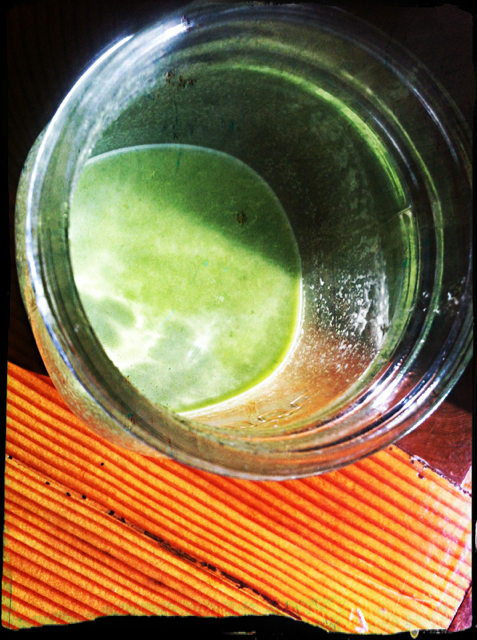 OR Spring ahead, for the rest of May is 1/2 off, only $35 for a full on, whole foods cleanse. Get it while you can! 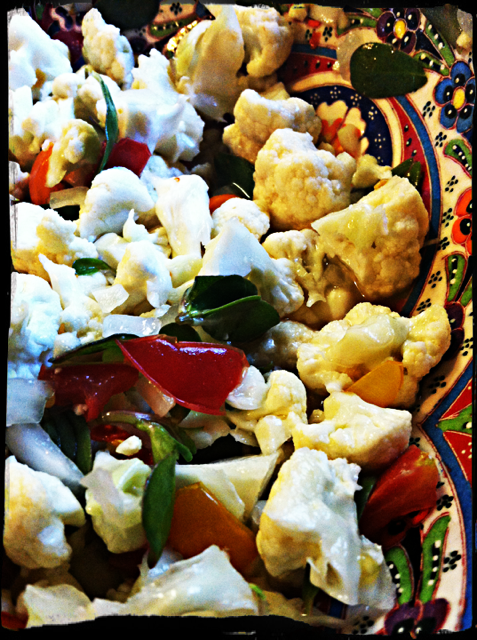 Posted in Recipes, Super foods and tagged breakfast, cleanse, dinner, feeding children, goji berries, health coach, healthy, healthy recipes, immunity, lunch, maca, seed to health, soup, summertime, super foods, sweet potato. Bookmark the permalink.